Coppa di testa. In France it is Fromage de tete. In England, it’s called brawn. All decent enough names; but they don’t translate well. At some point in the past, our ancestors decided to forgo the muscular moniker brawn for a direct translation of the French word for this fascinating cold cut — and by so doing doomed it. Even I get all squinchy when you call it head cheese. So I’ll call it testa, or brawn, not head cheese. Coppa di testa would probably be best here, because I use several Italian recipes to make brawn from the head of the recently slain Maximus the Wild Boar. Isn’t brawn is merely a hog’s head and a few trotters simmered with herbs, veggies and spices until the meat — and everything else — falls off. You then pick through the bits for the goodies, strain and reduce the stock and rely on the gelatin in it to set the sausage. Easy, right? Sorta. I adapted in this case by leaving the lid on, and it helped steam the top end of the snout, which doesn’t have all that much meat on it anyway. Because the head was small, I added two pieces of the backbone as well as the shanks from all four legs, plus a domestic pig’s trotter. I brought it to a boil, skimmed off the froth and then added aromatic goodies and let this think simmer for more than three hours. Four might have been better. When the meat became tender, it was time to pick it off the bones. Let me tell you this is a grim business. There are all kinds of tissues that attach themselves to a skull, and not all are good eats. Aim for what looks like meat. Skip the brains, and anything overly glandular. I reckon the yield is about 60 to 70 percent good stuff; I tossed the rest. You then chop the meaty bits into irregular pieces. I decided to make the tongue the largest bits, so I cut them into about 1/2 to 3/4 inch pieces. Everything else was chopped smaller, and some marginal bits I chopped even finer. You want various textures. I don’t know exactly why I wanted to stuff this into a beef casing. Part of it is because I had one in the freezer. Part of it was because I’d seen round coppa di testa before, and it looked tastier than the square loaves of head cheese I’d seen elsewhere. Either way works. It is purely a presentation thing; you don’t eat the casing. 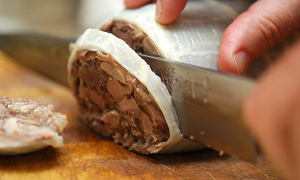 So I stuffed the head cheese into the beef bung cap — doesn’t that just make it sound even more revolting? — tied it off to compress the meat and broth, then hung it on a dowel set over the cleaned stock pot in the fridge overnight to set. Setting the gelatin in the stock is the bugbear of head cheese. Too much gelatin and you have an appalling, rubbery block o’heady grayness. 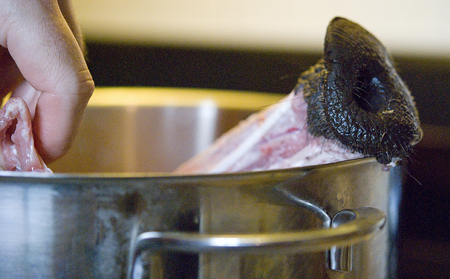 Mmmm… gray rubbery pig head… But too little gelatin and everything falls apart when you cut into the loaf or sausage. I had to wait a full 24 hours to know if I’d failed, as we were busy all that day. So when we came home last night, I brought out my sharpest knife, ran it under the hottest water I could get from the tap (this helps it cut cleanly through the head cheese), and sliced. I didn’t dare slice too thinly, as I knew I was a little on the light side when it came to the gelatin. But sliced thick, it worked. The testa held together on the plate, and could be sliced. All I could ask for. But would it be worth eating? I set up a tasting station: Plain, testa with grainy mustard, and testa with pickled bell peppers. But I think the best part was the gelatin, which just barely holds this thing together: When you eat it, the heat inside your mouth melts it immediately and it returns to brothiness — and I don’t know about you, but I’d rather taste brothiness than gelatinousness. Adding mustard is an excellent addition (very English), and adding the pickles is just as good. Holly thinks too much pickle with the testa overwhelms it, and I agree. She liked it best with a smidge of mustard and a little piece of the pickled bell pepper. For you hunters out there, it is a perfect use for a smallish big game animal; definitely a boar, but a doe deer would also be ideal. I still think the heads of larger hogs and deer are best broken down into cheeks (great cured or braised) and the tongue. As for the rest, you can then simmer it down, pick out the meat and run it through a grinder to make a ravioli filling. This is a recipe to make with a smallish animal’s head. Give yourself a few hours for this recipe, as you will need to simmer the meats for at least 3 hours. I make this with a wide beef casing, but you can simply pack it into a regular loaf pan. You absolutely need the pig’s feet for this recipe — they provide much of the gelatin that will make this set up. 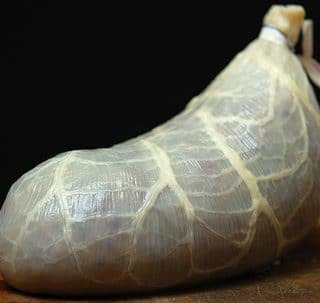 Ask your butcher for them; they freeze well, and as you are using them for gelatin not for fine eating, you can even re-freeze them if need be. Rinse and clean all the meats under cold water, then put them in the largest pot you own. Move the pot off-center to the burner a little. Cover with cold water and bring to a boil. Skim the froth off the top. Since you put the pot off-center, the froth should all be on one side of the pot. Once the froth is all off, move the pot back to the center of the burner. Turn the heat down to a simmer, add all the other ingredients, stir to combine and simmer for at least 3 hours. Older animals will require more time. 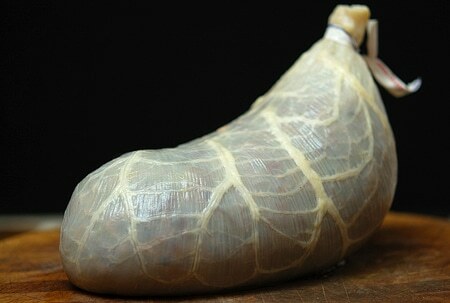 Soak a large beef casing in warm water with a tablespoon or two of vinegar in it. Remove the meats from the pot and set in a bowl. Strain the stock well and return it to a clean pot. Bring it to a boil off-center — like you did at the start — and get it at a rolling boil. 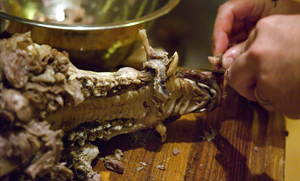 Pick the meats off the bone, peel and chop the tongue roughly, and chop fine some of the skin from the pig’s trotter. Chop everything in different sizes: Good-looking meats like the tongue should be between 1/2 and 3/4 inch, and everything else should be smaller. Marginal bits should be chopped the finest. When the stock has boiled down by a little more than half, add enough salt to make it taste salty — a little saltier than you think it ought to be. This is because cold meats need more salt than warm ones; it’s how we perceive it when eating. Turn the stock off the heat and pour enough to cover the meats. Let this cool a bit. Rinse the beef casing and tie the bottom securely. Take your time and do this right — you don’t want the bottom to break out when you are stuffing the testa. Stuff the casing by hand and tighten it before tying off the top. Leave a large loop of string at the top so you can hang the testa in the fridge. I hang it on a dowel set over a clean stock pot. Let this hang in the chiller overnight. Slice it thick and serve with something acidic, like mustard or pickles. Do not add more salt than is in the recipe until after the stock is reduced. You don’t want to make this overly salty, and you can make mistakes easily with salt when you are reducing a broth this much. 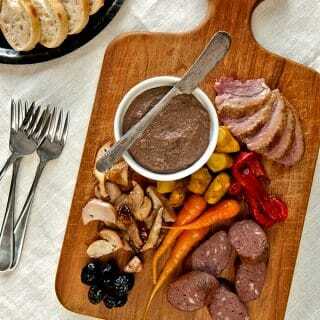 You can find all sorts of recipes for cured and smoked meats and fish here on Hunter Angler Gardener Cook! My in-laws are Filipino and they have a popular dish using pig heads called sisig (or sizzling sisig). What is particularly interesting about it is that the ears play a key role (pig ear has awesome texture – firm and crunchy but not chewy). In the making of the stuff it’s boiled til tender, then grilled, diced and fried. Kept in a tub with some of the broth in the fridge before the final fry it sets up in gelatin just like head cheese. Also pig ears and cheeks are $1/lb or less at Asian markets if there isn’t a boar handy. Well, being Cajun, I’ve been craving some of the spicy head cheese that I grew up in New Orleans eating. I had a hog’s head from a recent butchering of a pig, so I was excited to try my hand at it. While this isn’t a good recipe for exactly what I was looking for, it’s a great recipe. In usual Hank way, you explained some of the background of the dish and have awesome comments that follow up to the detailed work you present. I researched head cheese and found many different recipes but none were quite what I was seeking. I was looking for “Hot” Hog’s Head Cheese…I couldn’t find anything that sounded like it would be close to what I was seeking. So, the research I did focused on technique and some of the spices that sounded like they would fit the flavor profile I was trying to achieve. Then I finished with some green onions, paprika and cayanne pepper. We’ll see how it comes out tomorrow. It’s in the fridge cooling now. 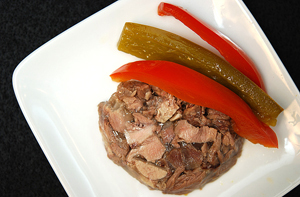 If you’ve ever had Hot Hog’s Head Cheese, you know it doesn’t fit any of the traditional profiles on the net. Your web site, blog, and now podcast taught really opened my mind to some non-traditional dishes. This is one. 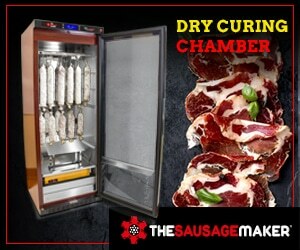 This particular post has a good basic technique…then you go over the top with a beef bung. Awesome.